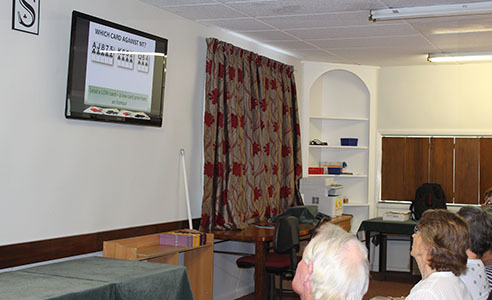 At Crockfords we are pleased to offer our series of 10 Beginners lessons for free. Our goal is for learners to not only achieve a basic understanding of the game, but more importantly to come away with an enthusiasm and love for Bridge- The ultimate card game. There are a number of good players at the club who can help you in your journey to play better Bridge. Don’t be shy, ask them for help. Your convenor will know where to point you. Also, when you get better you might like to help a new player not as far along the way as you. We have a library by the director’s desk with books that you can borrow. These free lessons are aimed not only at beginners who have never played before, but also anyone who needs a refresher course of the basics. We follow the standard NZ Bridge teaching materials so everyone learns the same system throughout New Zealand. If you would like to register for one of our future classes then please contact the office. To make friends and one particular friend, your partner. To have a social time with a group of like minded people. Bridge is great brain food, it makes you remember and think. To give yourself a challenge, learn a new and different “language” so you can communicate with your partner and understand what the opposition is saying. 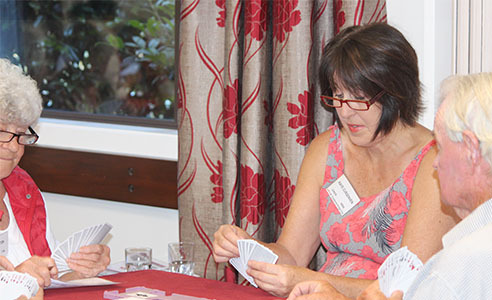 The game is also competitive where you and your partner have to make the most of the cards you have compared to all the other pairs who play your same hands. If you have missed a lesson or need to go through it again as a refresher then try these links. For the full list of NZ Bridge teaching materials for beginners please click here. These lessons are aimed at players who have been playing for a year or two. However, they are often useful to players of much greater experience who want to improve their card play, extend their system or keep up with the modern trends of bidding. Dates for future classes will be advised in the weekly notices.